I am so hung over. I should not have had three vodka drinks last night. Ok four. OK OK, five. Why do I subject my body to this. Great, this is not the best time to review music since almost anything will make me want to toss my cookies. I am not getting off this couch. 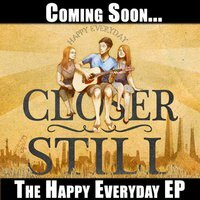 Oh well, This band "Closer Still" from Syracuse, NY will just have to deal with my bad mood converted into the review of their new album "Happy Everyday." Ok, first song is playing. Oh crap... This is good. Hmm great. Amazing. My headache is going away!!! Layered vocals and acoustic guitar are in the forefront. The male vocal is like Jack Johnson and the female sounds almost like Jewel with better teeth. The harmonies are tight and full with a pop-soul feel. The guitar picking counterpoints the vocal accents perfectly. Maybe this will be a good day. Thank you "Closer Still" your fantastic music has destroyed my evil mood and I am getting off this couch. I am going to be happy today!!!! Who wants to go on a picnic and frolic in the green grass under the trees? I'll bring my favorite new band "Closer Still" for us to listen to while we eat.